I’ve always liked the idea of a simpler, cleaner, minimalist life. I’ve made bits of progress toward that end many times, but I’ve decided that 2010 is the year I finally achieve blissful simplicity, and I’ve started already. I don’t want to go too far. I don’t want to spend my days in a plain white room sitting on a simple wooden chair, but I do want to declutter, simplify and minimize my possessions. I’ve heard it said that every object we own draws energy from us — some more than others, of course. Everything requires storing, and many items also need cleaning, folding, polishing, airing, rotating, refreshing or other attention on a regular basis. I’ve even rented space (called a storage unit) in the past to hold useless stuff that still has some kind of hold over me. I released that level of clinging to materialism years ago, but our house is small, and the clutter is closing in on us. Some of the things of life simply have to go for me to experience the kind of satisfaction — peace, I think it’s called — that I’m gearing my life toward experiencing. I won’t bore you with a lot of details in this post because I plan to do that in future posts! 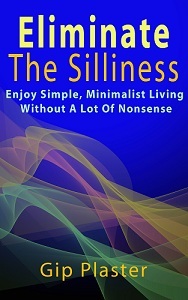 Actually, plenty of great articles (books even) have been written on all sorts of topics related to reducing clutter, minimalist life, voluntary simplicity and more. Researching simplicity can, in fact, be quite complicated because of the overwhelming amount of material written on the topic. And I’m contributing to it, I suppose. A simpler life is both a physical and a spiritual process, and in these early days, I’m focusing on the easy stuff: the physical clutter. My process begins in the kitchen, and it begins in the next post. I too want to declutter this year. I’m trying to put something*s* in the give-away box on a daily basis. Already beginning to see a difference…but…miles to go before I sleep…as it were! Very interested to see your suggestions!